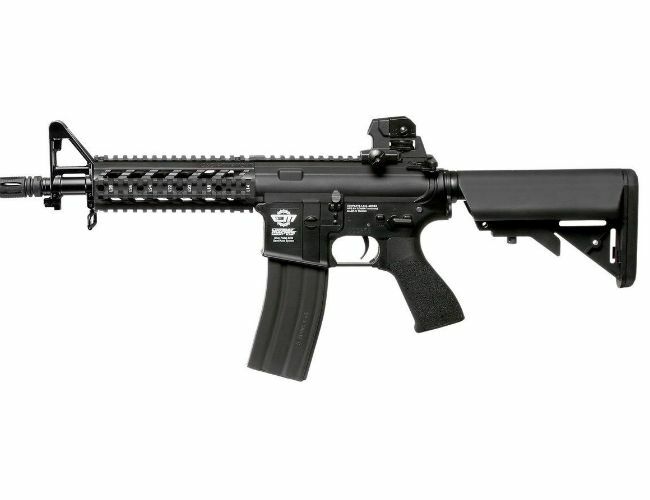 This G&G RAIDER frame is made from Polymer, , Rail and Grip but has Alloy Outer Barrel, stock tube and sling plate.The gun has 20mm RIS Hand-guard that can take other grips giving you more options. The Receiver also has a 20mm RAS/ RIS Rail allowing the attachment of scopes. It comes with iron sights with the rear sight being able to be removed with a useful finger screw. It has a 6 point crane stock and this gives good flexibility for different users. The battery is contained in the stock. This system keeps it simple and easy to connect. It also come with a flash hider and under this is a threaded barrel for attaching Tracers etc. This is great buy for people starting ut in the game and as a back up for other users. Extremely good rifle and reliable.Internal full metal gears and bearings. It has come in at around 328 FPS with a 02 gram bb this is only approximate speed as it can change with the conditions. In the box you get. Instruction book and cleaning rod. It needs mini 8.4v or 9.6v Crane Stock Battery Note this does not come with gun. Overall Length of gun is 662 mm. The gear box bearing is a 8mm oil less. The Motor is 25000 rpm Hi-torque. Inner Barrel is 233 MM. 328 fps using a .20g bb.